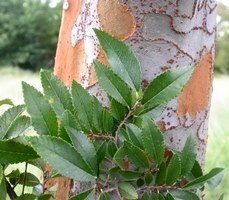 Ulmus parvifolia. Pieter Pelser.phytoimages.siu.edu. (Accessed 7/2014)..
Ulmus parvifolia is a tree 15-25 m tall, trunks sometimes fluted, bark mottled, flaking, twigs slender, finely hairy; winter buds small, to 0.3 cm long; stipules linear, base narrow. Leaves alternate, elliptic, 2-5 cm long, tip pointed, base unequal, smooth above, becoming leathery, margin toothed. Flowers green, small, in axillary clusters; blooms Aug.-Sept.
Fruit dry, 1-seeded, elliptic to egg-shaped, about 1 cm long, notched at tip. Habitat: Naturalized in horticultural sites, tolerates soil pH 4.8-7 (USDA, NRCS 2010). Notes: Apparently resistant to Dutch elm disease (Dirr 1990).